As these pages began to emerge the one word that kept popping into my head was 'Contrasts', so thats what these pages have been called. Using more of my scraps I glued strips of papers to the pages, stamped using black archival ink and then scraped white acrylic paint over making it quite thick in places. I left this to dry overnight. The next morning I painted with babywipes adding phthalo blue and transparent yellow iron oxide DecoArt media fluid acrylics to give me my colour base. 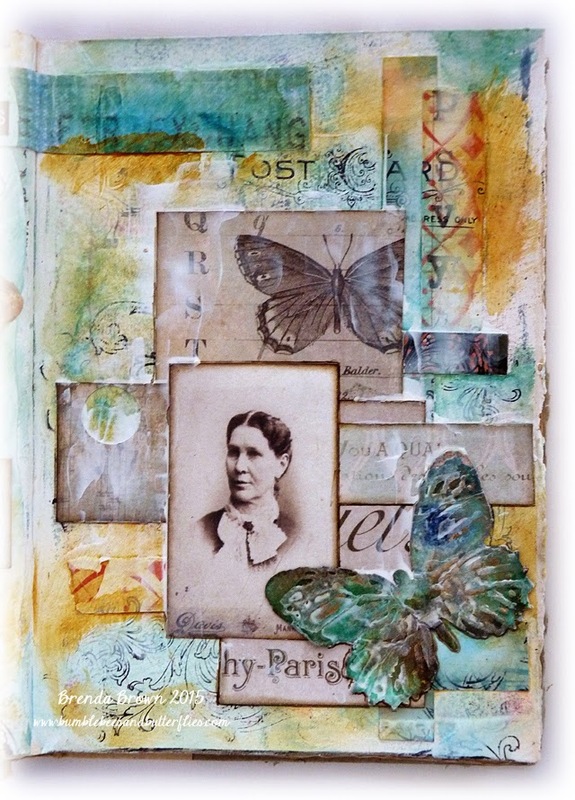 I decided what images I wanted to use and this was where the contrasts seemed to come in with the lovely warm colours contrasted to the quite austere lady in the photograph and the very shabby butterfly. 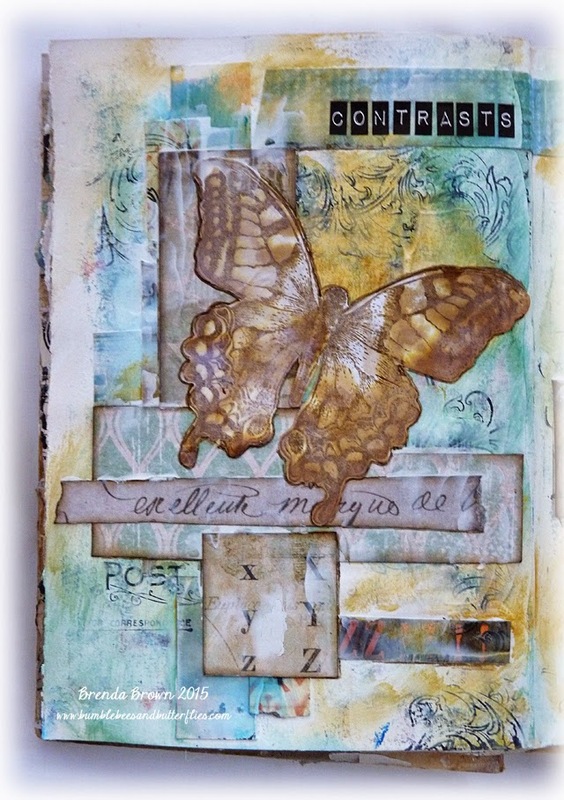 I really do seem to have a theme of butterflies developing in this journal. I still don't seem to be building any particular mixed media/collage style. I think my pages are all so very different. Thanks for popping by today and if you are following my weekly Visual Journal posts I hope you are enjoying seeing my pages as much as I am enjoying making them. 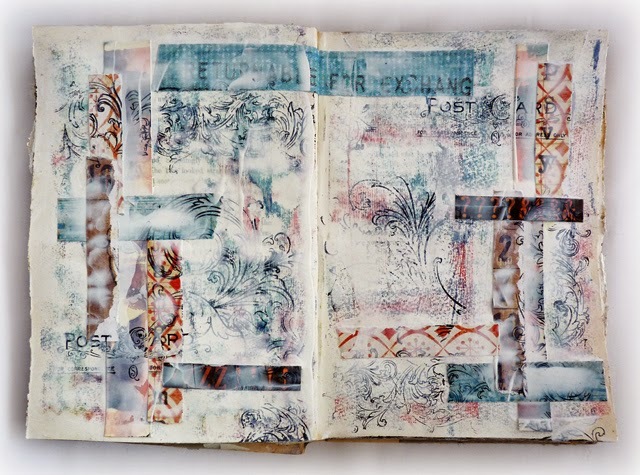 If you are creating journal pages then please link them underneath this post and if you want to share everyone who links here with others around the world please collect this code and add to your post. Oh WOW these are stunning pages! I just mentioned to my friend to pop by and share her beautiful pages. She's a brand new blogger! Great that you have a link for everyone to find great artists! YAY! A fabulous background, these colours work so well together and help your chosen images and papers literally pop off the pages! Wooow, Brenda, your pages are fabulous! Amazing color combination! I love how you put all the images and papers together! Love these! 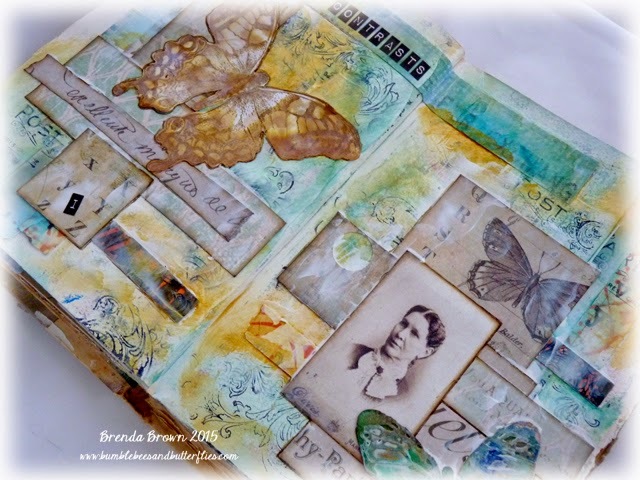 These pages are amazing Brenda, I love all the layers, textures and beautiful colours. Fantastic pages! I love seeing how they come together. Fabulous and great use of those wonderful butterflies! So you've been dipping into the scraps box again have you...well, it's turned out very nicely! No matter if there's no firm style developing yet as you certainly seem to be having lots of fun. Beautiful pages and contrasts is just the right word to describe the subtle colours you used. Beautiful pages, Brenda! 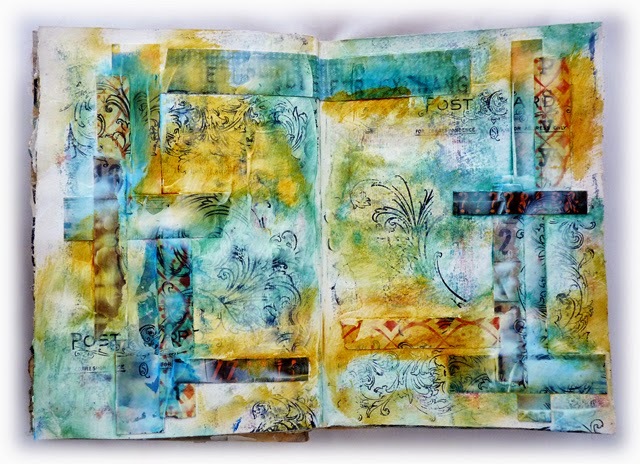 I do love the contrast in colors and mix of paper layers! Hugs! Wonderful Brenda and I'm loving all the beautiful butterflies! 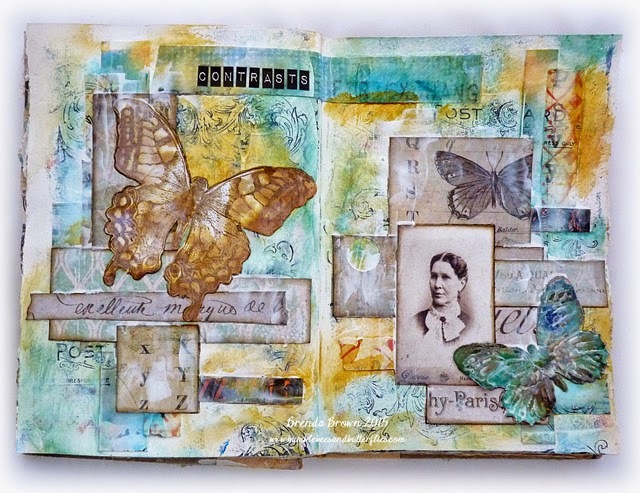 Beautiful pages Brenda , gorgeous colours, textures and images. Love the way you've used the butterflies. It's stunning! It really catched my eyes, I love the colours blending and the layers. Such a gorgeous journey this one.